By Dr. Angie Nastovska, Director of Humanities and Innovative Programs—iLEAD Schools. The iLEAD model, which is based on project-based learning schools, goes to the heart of how kids learn — not because such concepts are faddish. Technology integration is approached as an organic part of the learning process — not as a spiffy add-on. iLEAD’s core values focus on encouraging leadership by instilling in each learner the confidence and character that inspires others — not just part of a career track. That’s why iLEAD encourages learners to think for themselves. This requires a solid grounding in the arts, design and in humanities. It suggests a need for the learner to feel at home in the world. At iLEAD, “thinking for themselves” isn’t just about solving problems. Instead it is an organic view of the world in which they live. A world they will one day inherit. Finally, iLEAD’s approach to education places strong emphasis on the social and emotional development of the learners. This is based on the belief that there is an implicit, as well as an explicit, curriculum to teach. The ultimate goal for iLEAD is nothing short of learning in order to change the world. iLEAD’s priorities have always included participating on the cutting edge of changes in education and new trends, closely monitoring the development of learners, and approaching their educational needs in a holistic manner. Just recently, iLEAD set a new long-term goal that involves support from Eagle Rock School and Professional Development Center. New programs were about to be developed to maximize learners’ achievement by placing “passion” in the foreground of these programs. iLEAD had a strong vision for these programs, but was in need of a stronger agent in order to put this enormous endeavor into action. By partnering with Eagle Rock’s Professional Development Center, iLEAD’s vision for Innovation Studios and Empower Generations is reaching new heights. For two consecutive years, iLEAD has worked closely with Dan Condon, Eagle Rock’s associate director of professional development, in building all systems for Innovation Studios and Empower Generations. Innovation Studios is a passion-driven program for high school and middle school learners. Empower Generations is a passion-driven and trauma-informed program for pregnant, parenting and teens in need. Through the ongoing collaboration with Eagle Rock’s Professional Development Center, iLEAD was able to build these programs from the ground up — beginning with clearly defining iLEAD competency system to program systems for ongoing sustainability and accountability. In December, iLEAD staff members Allison Bravo, Empower Generations program coordinator; Suzanne Skomsvold, Innovation Studios program coordinator; Malaka Donovan, iLEAD Maker team representative and SCVi Resident Leader; and Angie Natsovska, iLEAD director of humanities and innovative programs, spent two days in collaborative sessions at Eagle Rock’s Professional Development Center. Since the beginning of our collaboration with Eagle Rock, we wanted to visit the school site and experience what we have only imagined to be stellar. Upon our arrival, we soon realized that we had arrived at an educational Mecca. Aside from the breathtaking views, well maintained and extremely clean campus, we were immediately drawn to the level of learner engagement, relationships, impeccable program development and extremely practical application. 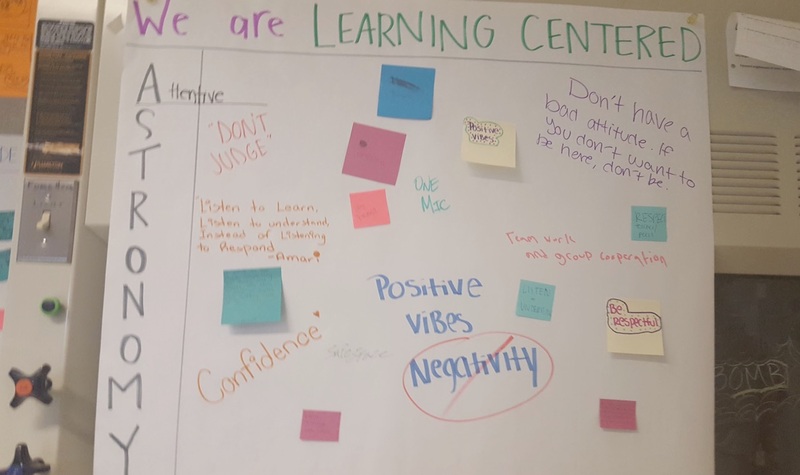 It was evident — both from our experience and the conversations we had with learners and staff — that education at Eagle Rock is simply a lifestyle that helps both learners and educators maintain a holistic balance through a well-rounded approach to education. For two days, under the amazing leadership of Dan Condon, our team learned about improvement science. 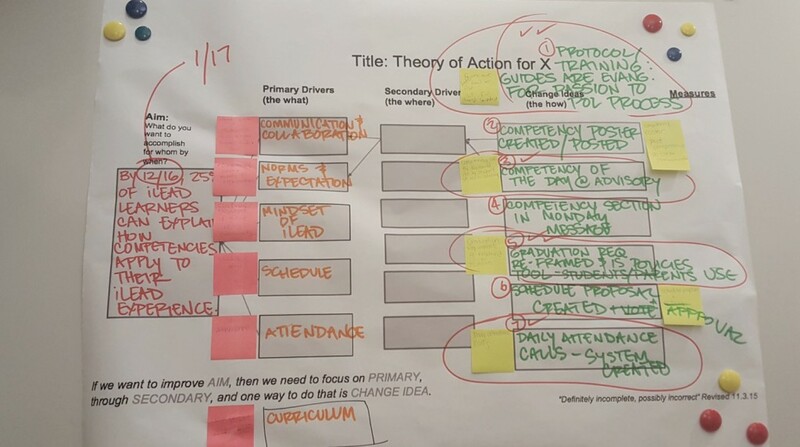 We worked through our own context to define goals, foresee possible problems, analyze different aspects, develop measurable outcomes, map the system, and then adopt goals and aims. Our main goals were to solidify both programs — Innovation Studios and Empower Generations. We started off with some brainstorming, big ideas, plenty of details, all of which resulted in experiencing the “magic” of Dan’s protocols. This positive shift helped our team become proactive and define smaller, measurable, authentic and much-needed next steps for our programs. Most important — and due in large part to our inspiring setting and location — our team’s level of energy, engagement and collaboration maintained the most positive tone. After our experience at Eagle Rock, we found ourselves hell bent on following our new action plan. Thinking back on those two days at the school, we remember several impactful and inspirational encounters. For example, we began and ended each day by dining on delicious offerings, served up by cheerful learners. We walked into classrooms where we were immediately welcomed and invited to join collaborate discussions that only further illustrate the true depth of learning that is going on at Eagle Rock. And we woke up at 5 a.m. each day to find a group of learners shoveling snow in front of our cabin. Again, these learners were cheerfully engaged in a work environment that appeared almost surreal. Intentionality and compassion are only two words of many that capture the incredible ‘ecosystem’ Eagle Rock has developed. Being able to share this wealth with other educators speaks volumes about the Eagle Rock’s Professional Development Center. iLEAD has been fortunate to work closely with Dan, who has selflessly devoted a great amount of patience, professionalism and understanding to our programs. And as a result, our collaboration is presently living and breathing around all iLEAD programs and schools. About the Author: Dr. Angie Jasna Nastovska is Director of Humanities and Innovative Programs at iLEAD — a nonprofit public charter school organization that develops self-directed learners, leaders, artists, multilingual speakers, entrepreneurs, and compassionate world citizens. 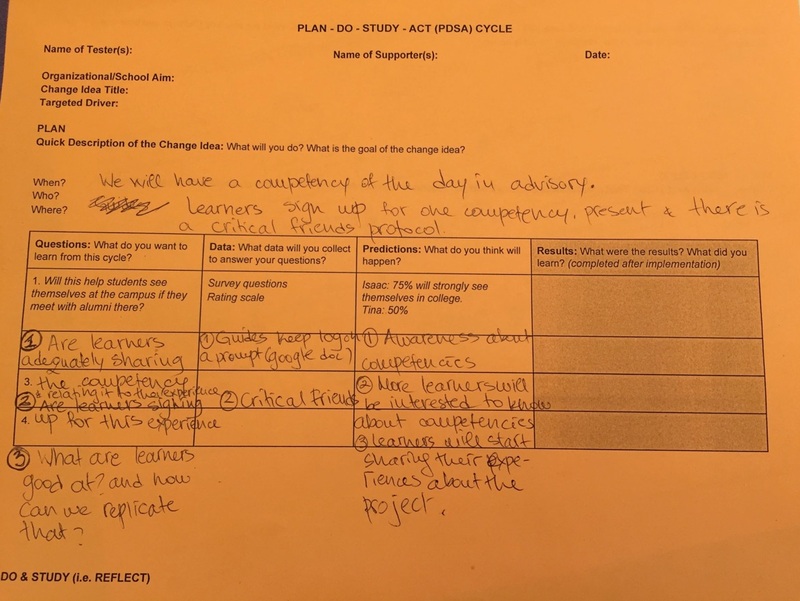 This entry was posted in Professional Development Center and tagged Allison Bravo, Dan Condon, Dr. Angie Nastovska, iLead Schools, Improvement Science, Malaka Donovan, Plan-Do-Study-Act Cycle, Theory of Action.